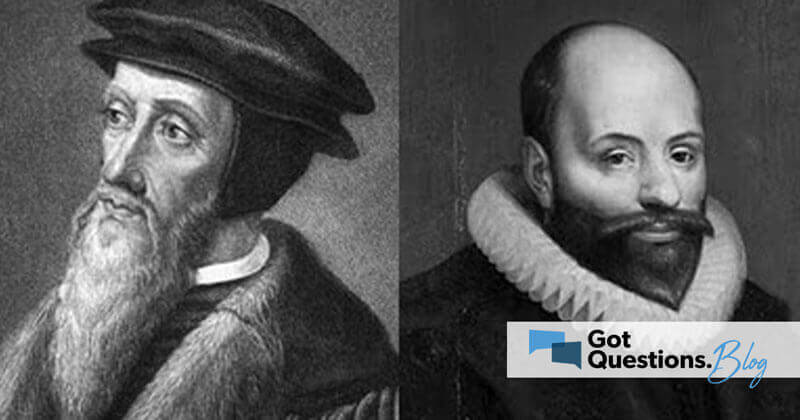 The term "Calminianism" is a combination of the terms "Calvinism" and "Arminianism." It is a term that has been invented to describe the many different viewpoints that fall somewhere between full Calvinism and full Arminianism. Interestingly, likely a majority of Christians could be described as Calminians. If you divide them by the points, between 5-point Calvinists and 5-point Arminians, there are 4-point Calvinists, 2-point Calvinists, 4-point Arminians, 3-point Arminians, etc., etc. Why all the confusion? Ultimately, it comes down to the fact that both Calvinism and Arminianism are human attempts to explain the unexplainable. God is absolutely sovereign in His election of who will be saved, and at the same time, humanity is completely responsible to receive the gift of salvation that God offers. How these two truths harmonize is incomprehensible to the finite human mind. But, in the infinite mind of God, the two truths do not contradict. As prideful humans, we do not like to admit that we do not fully understand something. So, instead of accepting our limitations and just trusting God, we develop complicated and detailed theological systems to try to make sense of it all. I struggled with Calvinism vs. Arminianism for a long time. Thankfully, God eventually brought me to a point that I essentially gave up trying to fully understand how the sovereignty of God and responsibility of man work together in salvation. Just as I had previously admitted that I do not fully understand the Trinity or the hypostatic union, adding sovereignty vs. responsibility to the list of incomprehensible truths was, for me, a tremendous relief. It seems to me that it is far more valuable to be actually proclaiming the Gospel than arguing about how precisely a person comes to accept the Gospel. Still, in my service at GotQuestions.org, people try to pin me down on my Calvinism vs. Arminian beliefs. No one has ever been satisfied with the answer: "I am a Calminian." So, here is my best attempt to explain the conclusions I have reached. Since I definitely have Calvinist leanings, I'll break it down by the 5 points of Calvinism. Total Depravity — I actually prefer the phrase "total inability" because it more accurately describes the concept. The phrase "total depravity" makes it sound like people are as completely depraved as it is possible to be. Few people, if any, have truly reached the point that they are absolutely as depraved as they could be. Instead, "total inability" is what Jesus declares in John 6:44, "No one can come to me unless the Father who sent me draws him, and I will raise him up at the last day." That is simple enough. No one can come to salvation unless God draws. We are completely unable to come to God on our own. Are people utterly dead, requiring God to actually regenerate them before they can believe? Or, are people only in need of a spiritual eye-opening and heart-softening before they can believe? I'm not sure. Unconditional Election — The debate on this point is whether God elects people to salvation because He foreknows that they will have saving faith (conditional election), or whether God elects people to salvation entirely on His own sovereignty, with the foresight of faith having no role (unconditional election). On this point, I definitely lean towards unconditional election. At the same time, I do not think it is wise, or biblical, to deny God the ability to elect based on something He knows due to His perfect omniscience of all things, past, present, and future. After all, as we see with "total inability," no one comes to faith unless God draws, so if God foresees faith, it is because He chose to enable that faith. Limited Atonement — This is probably the most hotly debated of the five points. Did Jesus die for the elect (limited atonement), or did Jesus die for everyone (unlimited atonement)? Making this issue particularly difficult is the fact that there are Scriptures which seem to support both sides. John 10:15 states that Jesus laid down His life for the sheep, and in the context, the sheep are clearly those who believe. First John 2:2 states that Jesus is the atoning sacrifice for sins of the entire world. So, which is it? Did Jesus die only for the elect or did He die for the entire world? For me, the key fact is that while Jesus' death is sufficient for the sins of everyone in the entire history of the world, His death is only effectual for those who receive it in faith. Yes, the atonement is limited in that it does not guarantee the salvation of everyone. Yes, the atonement is unlimited in that the forgiveness it provides is sufficient for the sins of everyone in the history of the world. Irresistible Grace — This is another one that I do not particularly care for the terminology. Instead, I prefer "effectual calling." "Irresistible grace" carries the idea of someone being dragged to salvation kicking and screaming. While God certainly could do that if He chose to, it is not the picture the Bible presents. Look at the example of the Apostle Paul. God was clearly calling Paul to faith in Christ, but Paul was resisting. It wasn't until God opened Paul's eyes, ironically by blinding him, that Paul received Christ as his Savior (Acts 9). Clearly Paul was resisting, but when God opens a person's eyes to the truth, that truth is irresistibly compelling. Perseverance of the Saints — While I do not deny that a true believer will persevere until the end (Matthew 24:13; 1 John 2:19), I prefer the phrase "eternal security." Some misunderstand "perseverance of the saints" to mean that we must maintain our own salvation by persevering. That is not what the Bible teaches. A true believer will persevere to the end, but that perseverance is a result of God's transformation (2 Corinthians 5:17), and the Holy Spirit's sealing (Ephesians 1:13-14). It is God's work, not ours. I unequivocally believe in eternal security because I believe Jesus' sacrifice to be so perfectly sufficient that it guarantees the eternal salvation of all who receive it. So, that is why I consider myself a Calminian. Perhaps it should be CALminian, due to the fact that I have definitely landed closer to Calvinism than Arminianism. Still, I get accused of being wishy-washy and/or having my feet firmly planted in mid-air. So be it. Somehow, in the mystery of God, the sovereignty of God and responsibility of man touch, and the result is salvation. Men and women who are far more intelligent than I am have grappled with this issue for thousands of years. I simply admit that I am not going to be the one to settle the debate, therefore, I stop trying. Am I saved because I chose God, or because God chose me? Yes.